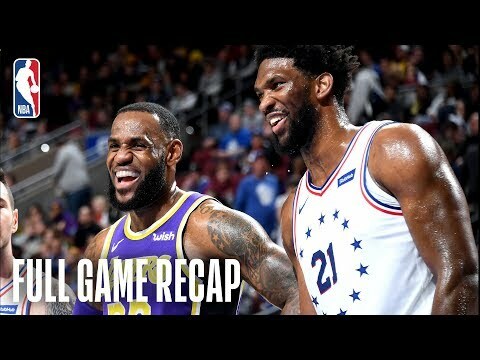 The 76ers defeated the Lakers 143-120, this afternoon in Philadelphia. Joel Embiid paced the 76ers with a team-high 37 points (12-16 FG), 14 rebounds, and 3 assists in the victory, while Tobias Harris tallied 22 points (9-14), 6 rebounds and 6 assists in his second game as a 76er. Kyle Kuzma poured in a game-high 39 points (14-21 FG, 6-7 3pt FG) for the Lakers, as LeBron James followed with 18 points (8-16 FG) to go along with 10 rebounds and 9 assists in the losing effort. The 76ers shot 50.0% (12-24) from three in the game. With the win, the 76ers improve their record to 36-20, while the Lakers fall to 28-28 for the season.